This study examines the Australian Capital Territory (ACT) Government’s navigation of its land-use planning law to implement a supermarket competition policy. It shows how big issues of competition and planning are worked through the particulars and processes of legal regulation. The study tests whether local planning law might balance economic diversity and urban amenity with the competitive strengths of the major supermarket chains. It provides insights into ACT planning law. Changes in political leadership in New South Wales in 2016–2017 can be attributed in part to electoral feedback on the NSW Government’s Fit for the Future program which was part of a broader local government reform project. This article discusses the background and processes involved in that Program, and the diverse democratic responses it invoked. New South Wales’ innovative Regional Joint Organisations, and far west initiatives, are also noted. 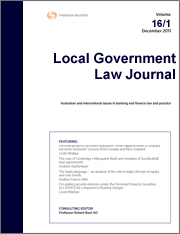 For the PDF version of the table of contents, click here: LGLJ Vol 22 No 3 Contents.